Liczba stron: 56 Jest to ujednolicona liczba stron, która ułatwi Ci porównanie długości książek. Każda strona Legimi to 200 słów. 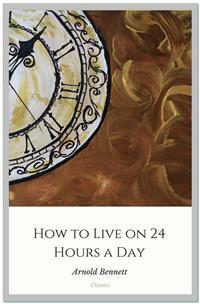 You have to live on twenty-four hours of daily time. Out of it you have to spin health, pleasure, money, content, respect, and the evolution of your immortal soul. Its right use, its most effective use, is a matter of the highest urgency and of the most thrilling actuality. All depends on that. Your happiness - the elusive prize that you are all clutching for, my friends! - depends on that.Which of us lives on twenty-four hours a day? And when I say "lives," I do not mean exists, nor "muddles through." Which of us is not saying to himself - which of us has not been saying to himself all his life: "I shall alter that when I have a little more time"? "Yes, he's one of those men that don't know how to manage. Good situation. Regular income. Quite enough for luxuries as well as needs. Not really extravagant. And yet the fellow's always in difficulties. Somehow he gets nothing out of his money. Excellent flat--half empty! Always looks as if he'd had the brokers in. New suit--old hat! Magnificent necktie--baggy trousers! Asks you to dinner: cut glass--bad mutton, or Turkish coffee--cracked cup! He can't understand it. Explanation simply is that he fritters his income away. Wish I had the half of it! I'd show him--"
We are nearly all chancellors of the exchequer: it is the pride of the moment. Newspapers are full of articles explaining how to live on such-and-such a sum, and these articles provoke a correspondence whose violence proves the interest they excite. Recently, in a daily organ, a battle raged round the question whether a woman can exist nicely in the country on L85 a year. I have seen an essay, "How to live on eight shillings a week." But I have never seen an essay, "How to live on twenty-four hours a day." Yet it has been said that time is money. That proverb understates the case. Time is a great deal more than money. If you have time you can obtain money--usually. But though you have the wealth of a cloak-room attendant at the Carlton Hotel, you cannot buy yourself a minute more time than I have, or the cat by the fire has. Talk about an ideal democracy! In the realm of time there is no aristocracy of wealth, and no aristocracy of intellect. Genius is never rewarded by even an extra hour a day. And there is no punishment. Waste your infinitely precious commodity as much as you will, and the supply will never be withheld from you. Mo mysterious power will say:--"This man is a fool, if not a knave. He does not deserve time; he shall be cut off at the meter." It is more certain than consols, and payment of income is not affected by Sundays. Moreover, you cannot draw on the future. Impossible to get into debt! You can only waste the passing moment. You cannot waste to- morrow; it is kept for you. You cannot waste the next hour; it is kept for you. You have to live on this twenty-four hours of daily time. Out of it you have to spin health, pleasure, money, content, respect, and the evolution of your immortal soul. Its right use, its most effective use, is a matter of the highest urgency and of the most thrilling actuality. All depends on that. Your happiness--the elusive prize that you are all clutching for, my friends!-- depends on that. Strange that the newspapers, so enterprising and up-to- date as they are, are not full of "How to live on a given income of time," instead of "How to live on a given income of money"! Money is far commoner than time. When one reflects, one perceives that money is just about the commonest thing there is. It encumbers the earth in gross heaps. If one can't contrive to live on a certain income of money, one earns a little more--or steals it, or advertises for it. One doesn't necessarily muddle one's life because one can't quite manage on a thousand pounds a year; one braces the muscles and makes it guineas, and balances the budget. But if one cannot arrange that an income of twenty-four hours a day shall exactly cover all proper items of expenditure, one does muddle one's life definitely. The supply of time, though gloriously regular, is cruelly restricted. Which of us lives on twenty-four hours a day? And when I say "lives," I do not mean exists, nor "muddles through." Which of us is free from that uneasy feeling that the "great spending departments" of his daily life are not managed as they ought to be? Which of us is quite sure that his fine suit is not surmounted by a shameful hat, or that in attending to the crockery he has forgotten the quality of the food? Which of us is not saying to himself--which of us has not been saying to himself all his life: "I shall alter that when I have a little more time"? "But," someone may remark, with the English disregard of everything except the point, "what is he driving at with his twenty-four hours a day? I have no difficulty in living on twenty-four hours a day. I do all that I want to do, and still find time to go in for newspaper competitions. Surely it is a simple affair, knowing that one has only twenty-four hours a day, to content one's self with twenty-four hours a day!" To you, my dear sir, I present my excuses and apologies. You are precisely the man that I have been wishing to meet for about forty years. Will you kindly send me your name and address, and state your charge for telling me how you do it? Instead of me talking to you, you ought to be talking to me. Please come forward. That you exist, I am convinced, and that I have not yet encountered you is my loss. Meanwhile, until you appear, I will continue to chat with my companions in distress--that innumerable band of souls who are haunted, more or less painfully, by the feeling that the years slip by, and slip by, and slip by, and that they have not yet been able to get their lives into proper working order.